Editor's note: Since the review went to press, Meadowlakes has become a private club. 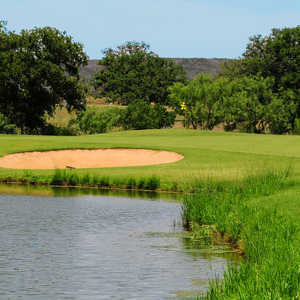 Marble Falls, TX - Meadowlakes Country Club, located an hour west of Austin in Marble Falls, was born out of friendship. One day in the late 1960s, a gentleman approached Lee Blocker, the president of the Lakeway Land Company and the company that had developed the Lakeway Resort community just west of Austin in the 1960s. The gentleman was named Pierre Caselli. He wasn't a stranger to Blocker. In fact, he happened to be one of Blocker's employees. Caselli was the head chef and general manager of the Lakeway Inn and Marina. Caselli had an idea. He had seen Blocker develop various projects through the years and he wanted to be part of one such development project with Blocker. As a friend, not his boss, Blocker agreed. As a result of their discussion, Blocker and his company purchased a large pecan orchard in Marble Falls near the Colorado River. Caselli would be intimately involved in development and management of the project. One of the first moves the two men made was locating an architect to design the golf course and the surrounding development. Enter Leon Howard. 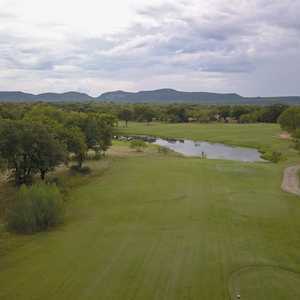 Howard, who has designed more than 150 courses in his career, including the two courses at Lakeway, as well as many golf course communities, was hired in 1970. For the next two years Howard worked with Caselli and Blocker. Finally, in 1973, the first nine holes of Meadowlakes Country Club were carved out of the pecan orchard and ready for play. Unlike most of the courses Howard has designed, the first nine only featured one hole with water - the par 4, 379-yard fourth hole. This, by itself, makes the front side of Meadowlakes unique because Howard has always been very liberal in his usage of water on his course designs. He says he likes including water for several reasons. "First of all, it's easy to maintain. It is also challenging for the player and it adds to the beauty of the course." No. 4 is one of the prettiest holes on the 6,600-yard course and that beauty has earned it designation as the signature hole. A small pond sits within reach off the tee and features a large fountain in the middle. If the pond doesn't pose enough of a challenge, several clusters of pecan trees on either side of it do, which have made it the No. 1 rated hole on the course. A well-placed tee shot is a must in order to score par. The remainder of the front nine, as would be expected, features many pecan trees. Howard creatively carved doglegs to both the left and right through the orchard that puts a premium on accurate shot placement off the tee. If you do find the large pecan trees on the front side and your score suffers, take solace. The back side is more wide open. While the back side, which officially opened two years later in 1975, is without the large pecan trees, it isn't without danger. Howard, when designing the back side in what were once meadows, put his stamp on the course as six holes on the back side prominently feature the wet stuff. Starting right out of the gate on No. 10, a par 4 of 376 yards, a large pond sits directly in front of the tee box. A well-struck tee shot is required to carry the approximate 200 yards or your ball will find a watery grave. Water is located on two of the next three holes in a small creek, but it is not visible. Out of sight, out of mind. Heading down the backstretch and the final five holes, Howard wasn't shy about his placement of water. No. 14 is one of the prettiest and challenging holes on the course. Water lies along the left side of the plush Bermuda fairway for the length of your drive. If you successfully find the relatively open fairway, your approach is over a small tributary to the Tifdwarf Bermuda green. To finish your round, the three final holes each feature water that is reachable off the tee. No. 16, a par 4 of 357 yards plays downhill and an iron is recommended off the tee because you can easily drive into the small pond. No. 17 is a par 3 of 185 yards that features yet another small pond and a sand bunker in front of the green, one of only two on the course. The finishing hole is the mother of all water holes. The par-5, 537-yard dogleg to the left includes three ponds. Directly in front of the tee is a small pond that requires a carry of almost 200 yards. You must not only clear the first pond but also place your ball in the fairway before two more ponds that sit on either side of the fairway at the bend of the dogleg. 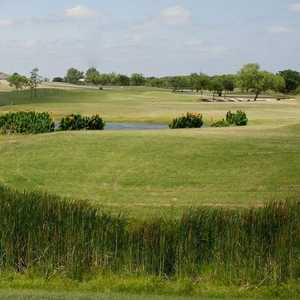 If you successfully maneuver around the ponds, your approach is to an uphill green that is protected by several mounds. This hole is the prototype for the back nine as it features water and plays much like a links-style course. When you conclude your round at Meadowlakes Country Club, you have a very strong sense that you have played almost two completely different courses. Both, however, are very pleasing to the eye and challenging. One final piece of advice: it might be a good idea to bring your ball-retrieval device, or at the very least, plan on sacrificing a few balls to the Water Gods on the back nine. Leon Howard is smiling with each splash. From Austin, go south on IH-35 to Highway 71. Take a right and go west on Highway 71 approximately 40 miles to Highway 281. Take Highway 281 to the right and go north approximately 8 miles. In Marble Falls, turn left on Highway 1431. Take Highway 1431 west and turn left at the light on Meadowlakes Drive. Follow Meadowlakes Drive and you will see the clubhouse.